At the Tank Museum, mentioning the Battle of Arras is likely to bring to mind the tank attack on the 21st May 1940 rather than the much larger and far bloodier battle fought 23 years earlier, but which today is largely unremembered. 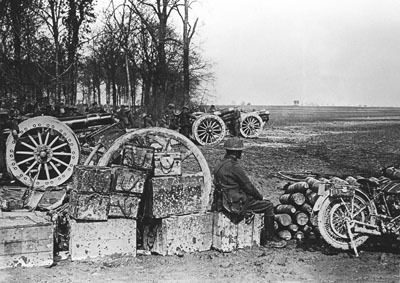 The April – May 1917 Battle of Arras was the British Empire’s part of a larger offensive planned by the French. Arras would both divert German attention from the French attack, to be launched further south along the Aisne, and allow the British to test newly developed offensive tactics. 18 pounder guns at Arras, the standard British field gun. 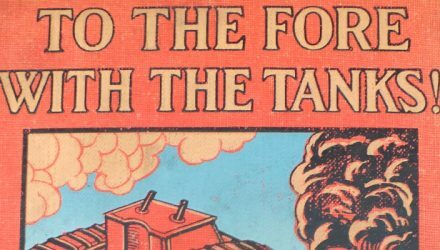 Two training pamphlets introduced these tactics to the British Army. Pamphlet SS135 concentrated on the use of the Division of around 18,000 men, whereas SS143 focused on the Platoon of around 40. Both emphasised the importance of coordination between units and the use of combined-arms tactics when attacking German positions. In the lead up to the battle the artillery used new techniques to target German positions. Flash spotting and sound ranging were highly advanced techniques based on cutting edge scientific research. 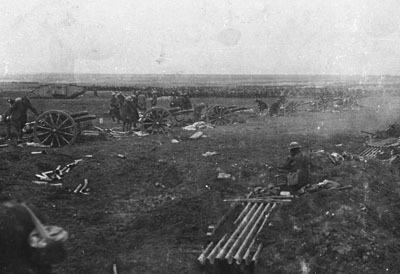 Gunners could now accurately locate and fire on German artillery, forcing the crews to seek shelter and preventing them from shelling the advancing British infantry. Thanks largely to this development over 80% of the German guns around Arras were neutralised during the five day preliminary bombardment. Heavy 6 inch 26 cwt howitzers, which had a maximum range of 8,700m. The development of the creeping barrage (shellfire that moved forwards with the advancing infantry) meant Germans sheltering in dugouts had no time to man their machine guns between the end of the barrage and the arrival of the British infantry. 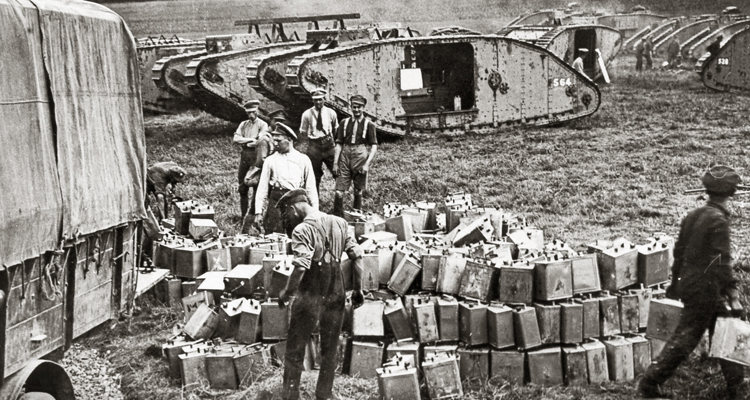 In addition, before Arras most of the fuses fitted to these shells included a short delay, leading to them exploding underneath the German barbed wire, leaving it largely intact. The advanced new 106 fuse eliminated this delay, meaning shells detonated in contact with the wire, cutting it and allowing the infantry to quickly advance through it. The first day of the offensive, the 9th April, was a great success. Most famously the Canadian Corps captured Vimy Ridge in a highly successful attack that also had a great impact on the development of Canada’s national identity. Further south in the Scarpe valley British Divisions along with small numbers of tanks advanced unprecedented distances through the snow against German forces exhausted and demoralised by the bombardment. 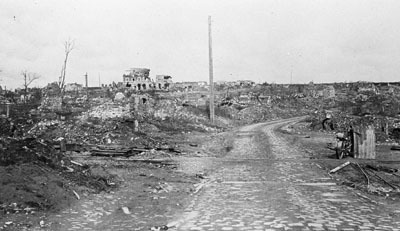 The effects of the war on Fampoux, near Arras. On the 11th British and Australian forces attacked around Bullecourt. 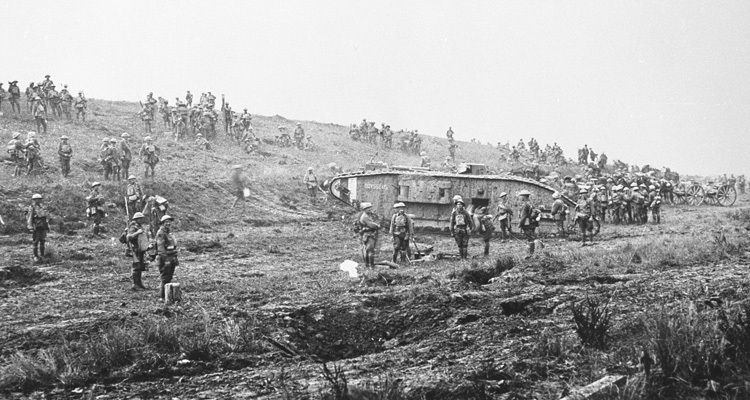 Although the Australians were supported by tanks, they either broke down or were quickly destroyed. The attack was further hindered by a lack of artillery support and strong German counterattacks. 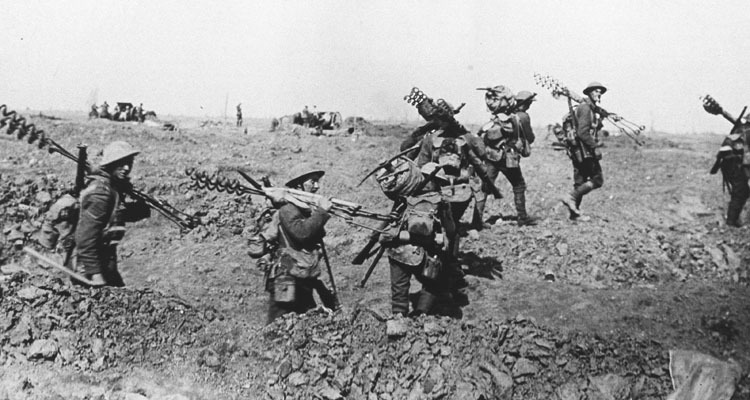 The Australians were forced to retreat and suffered over 3,000 casualties. By this point German reserves had begun to arrive and their defences were reorganised. This led to slower progress and higher casualties for the British. Further attacks and counter-attacks continued until the 16th May. The two largest were on the 23rd April and the 3rd May with tanks being used on both days. In the face of strong German resistance, neither were successful. On the 3rd May over 7,000 British soldiers were killed. This was one of the highest totals on one day during the entire war. The battle continued as long as it did largely to support the French. Their attack was going badly and they needed the British to keep pressure on the Germans. As successful as the first day had been, the later stages of the Battle of Arras showed that the British were still unable to convert a break-in, where they captured front line German positions over a limited area, into a break-through, where the Germans were forced into a large scale retreat. For British soldiers the average daily loss rate at Arras was the highest of the war at 4,076. Total casualties amounted to 158,000, with the Germans losing around the same number. Despite the mixed results, the experience of Arras continued the learning process the British Army went through throughout the war. It also contributed to the wearing down of the German Army. The effects of both these factors would become clear in 1918. 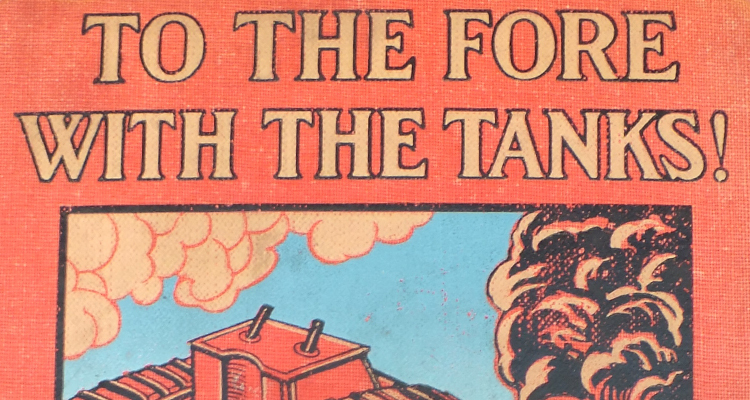 Find out more about The Tank Museum’s Mark II here. This vehicle is the oldest surviving combat tank in the world and was used at the Battle of Arras. I understand from an article in an Australian newspaper that permission has been granted to explore the Bullecourt area more thoroughly to try to find the location of the 6 tanks that went missing on 3 May 1917. Do you have any information on the progress that is being made? My grandfather, George Christopher Fisher, was a Corporal in ‘D’ battalion, Machine Gun Corps (Heavy Branch) who was reported missing (subsequently changed to died) on 3 May 1917. 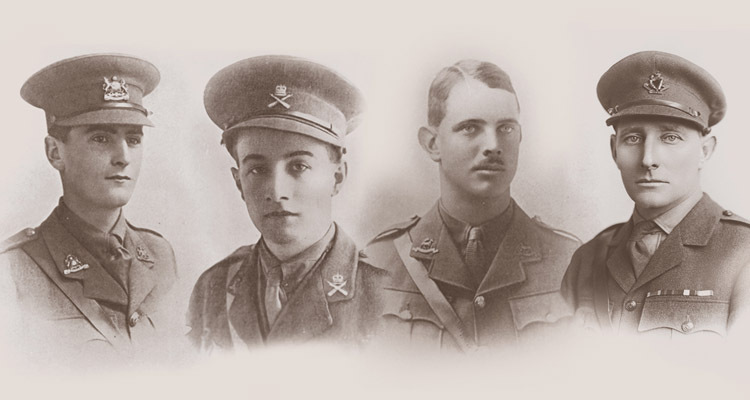 Everything points to him being involved in the tank battle on 3 May 1917 & as his name does not feature in the names of those whose bodies were found, it is assumed that he was a corporal on one of the 6 tanks that went missing that day. He has no known grave but is remembered with honour at the Arras Memorial. Any information or help would be much appreciated.